A few weeks ago, I was sent a beautiful box of goodies from JB Weld. I'm the kind of girl who loves a Saturday morning outing to the hardware store so believe me, I was excited! I love to hunt down vintage treasures that need fixing and when I find myself in broken vintage tragedy, I keep the pieces in a safe spot till I can find the right thing to fix it with. In the past, I've used a slow setting 2 part epoxy to repair broken bakelite bangles but today I decided to try it out with JB Weld quick set epoxy to see how the results differed. 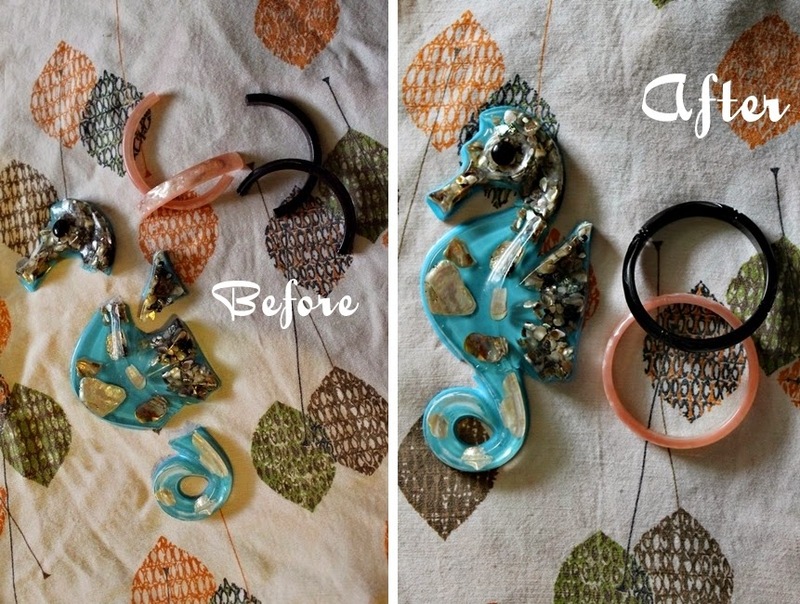 I also had a broken pink Lucite bangle and Lucite seahorse that fell off the wall in the bathroom to repair. The pieces were ready to handle in about a half hour but I let them sit overnight before trying to use them. Once the epoxy became tacky, I pressed the bangles together to form a tight bond, holding them in place for about 15 minutes. Aside from repairs, I always keep JB Weld in my crafting box for making jewelry. I've bought a bunch of vintage and vintage styled findings from the craft stores, flea markets and antique malls. With a little JB Weld and a pin back, you can make your own brooches, sweater clips earrings and dress clips. I hate to use any kind of jewelry glue because if the bond wears off, you risk losing these one of a kind findings. Since JB Weld reinforced with steel, I can wear these pieces without fear of losing anything. For these projects I used a pair of deco style findings from a craft store, an antique key and a broken deco brooch. I use a fair bit of glue and epoxy in my various craft projects, jewelry making included, and am always on the hunt for new, versatile, durable (aka, strong!) products, so I'll certainly be checking their offerings out further. Thank you very much for the lovely intro! When working with JB Weld, how do you keep it from sticking to your work station or other items? Thanks for this little tutorial, just what I was researching. Disappointed in the long-term hold of E-6000 barrette backs to paper-covered aluminum top. Trying the JB Weld now.